Panathinaikos hammered Maccabi Electra 93-73 in Game 1 of their Turkish Airlines Euroleague Playoffs series at OAKA on Tuesday night. The rematch of last season’s championship game turned ugly early as the Greens delighted their fans. 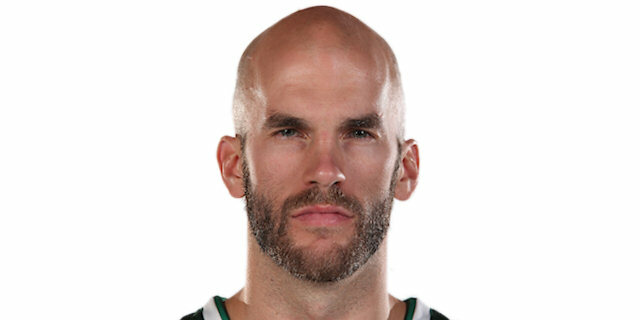 The outcome was decided during a five-minute stretch to end the first quarter and start the second in which Nick Calathes scored 10 as Panathinaikos broke open an 18-18 tie with 22 unanswered points. The lead would reach the 30s in the third quarter and Maccabi never threatened again. 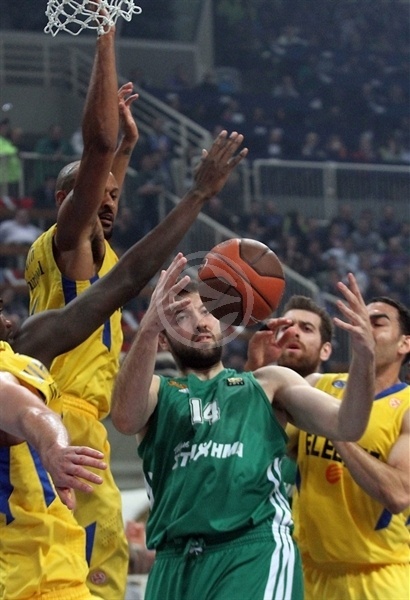 Euroleague MVP Dimitris Diamantidis was the star of the show with 15 points and 8 assists. 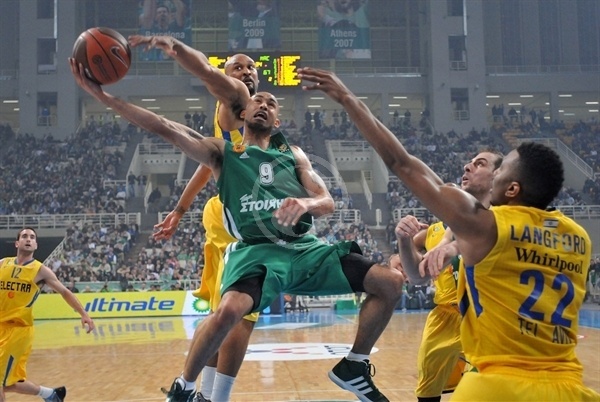 Calathes finished with 13 points and 8 rebounds, while Mike Batiste and David Logan added 11 each for the champs. 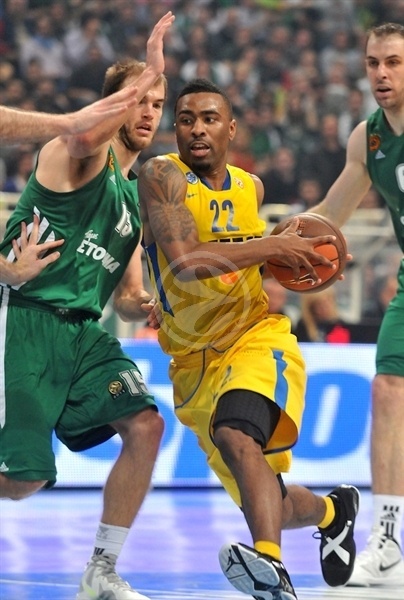 Maccabi’s lone bright spots were Keith Langford with 21 points and Devin Smith with 17. 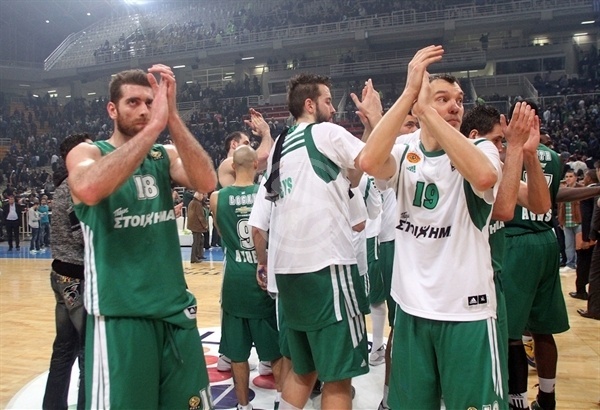 Game 2, also at OAKA, is set for Thursday night. Maccabi got the ball inside to Sofoklis Schortsanitis, but it was Tal Burstein that scored on the offensive glass for the game’s first points. Burstein was soon called for an unsportsmanlike foul on Calathes in the open floor, but the Greens only got 1 point out of it. 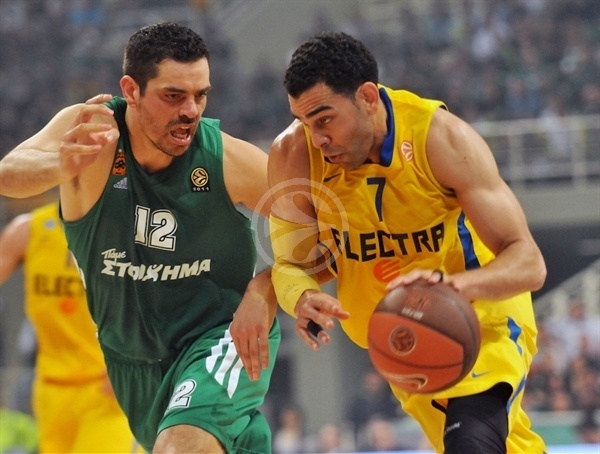 However Diamantidis soon teamed up with Aleks Maric for a pair of baskets and a 5-2 lead. The game continued to revolve around the big men. After Maric dropped a pass, Big Sofo passed out of a double team to Devin Smith for a triple. The momentum remained Green though as Diamntidis fed Steven Smith for a slam and then registered a steal and layup himself. 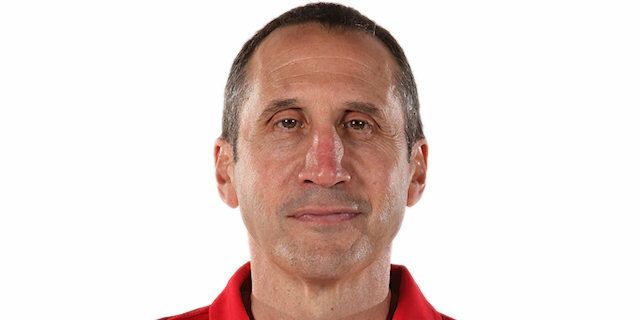 Maccabi coach David Blatt went to his bench early bringing in Yogev Ohayon, who promptly set up Devin Smith for a jumper. The Maccabi wins kept the visitors alive with a jumper and a floater sandwiching a Diamantidis-to-Mike Batiste alley-oop. 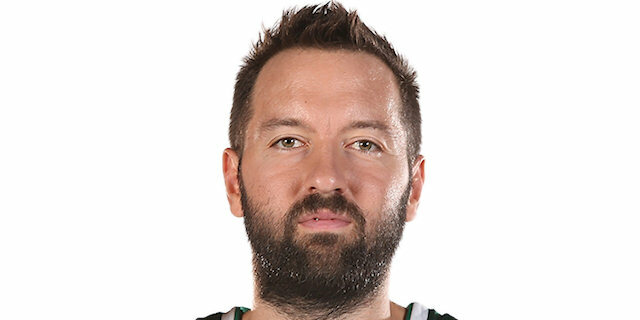 Langford connected from behind the arc to narrow the gap to 16-14 before a Sarunas Jasikevicius turnover led to a Lior Eliyahu slam to even the score. Fresh off a timeout, Kostas Tsartsaris set up Batiste for a slam and soon Diamatidis and Calathes connected for back-to-back triple as OAKA started rocking with the score 24-18. Saras then made a no-look dish to Batiste, who spun for a layup, which led to a Maccabi timeout. Then Saras made it a 10-point game with a pull-up jumper. Eliyahu missed 2 free throws with 3 seconds left to leave the hosts ahead 28-18 after 10 minutes. The Greens continued to control the game as Tsartsaris scored another triple and a pair of Schortsanitis turnovers led to Calathes layups. A Theo Papaloukas turnover gifted Logan an easy 2 as the hosts wrapped up a run of 19 unanswered points to take a 37-18 lead. Langford missed twice from the line and Calathes made it a 22-0 run before Langford finally hit a jumper to end a five-plus-minute scoring drought. 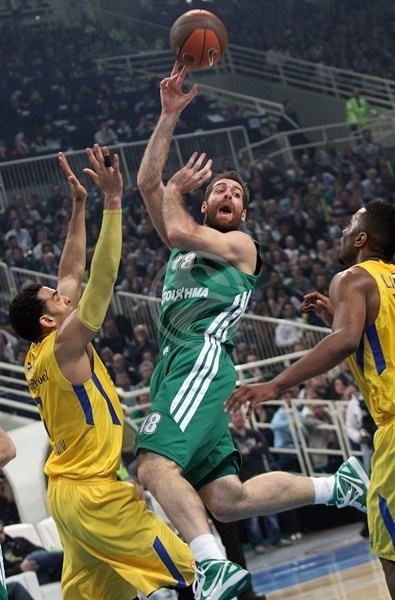 Big Sofo scored inside, but Saras bettered him with a three at the other end. A Devin Smith three-point play and a basket from Langford gave the visitors hope, but Logan scored with ease at the other end to keep the lead at 18. Diamantidis padded his impressive line with a basket-plus-foul. Free throws from Langford and Burstein were mere drops in the bucket, 48-31. Even after a Devin Smith triple, Diamantidis countered with free throws and Romain Sato beat the halftime buzzer to make it 55-34 at the break. A pair of Steven Smith triples followed by another from Diamantidis to open the third quarter gave Panathinaikos its biggest lead yet – 30 points! Ohayon got the Israeli champs their first second half point when he split free throws. 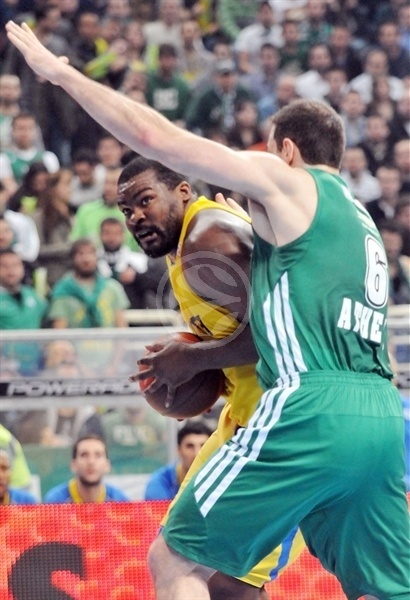 Panathinaikos continued to add to its lead as Maric made it 68-35. Langford tried to put a more respectable number on the board, but Ian Vougioukas lifted the hosts to a 34-point margin. A Richard Hendrix basket-plus-foul and David Blu triple dropped the deficit into the 20s. Stratos Perperoglou’s triple at the buzzer was ruled to be late after instant replay, leaving the score 79-52 through three quarters. By the fourth quarter the game was seemingly decided and played in an open style with many layups. Demond Mallet and Logan swapped threes as the lead stayed in the upper 20s. Baskets by Hendrix and Langford narrowed the gap to 90-69. And a Langford slam carried Maccabi within 19. But any hopes of a miracle Maccabi comeback were not be as even with the Greens taking their foot off the game, the clock left the visitors with too little time to change the outcome. "We played a good game, thanks to the concentration and the desire we had. Everything depends on the defensive spirit and we had it. 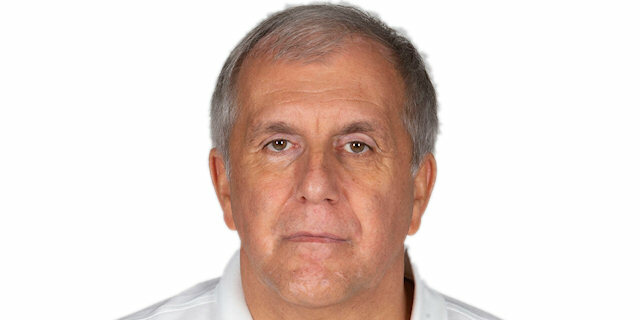 Additionally I am satisfied because we read successfully the defensive game of Maccabi, especially the matchups. It is not a single game, but a playoff series, so we have to forget what happened tonight and prepare another game from scratch. Maccabi has much of pride and they will try to react. I think that the fans enjoyed the game." "There are not a lot of things to say after such a game. We didn't show up, it is simple. Fortunately it is a playoff series and not a single game. 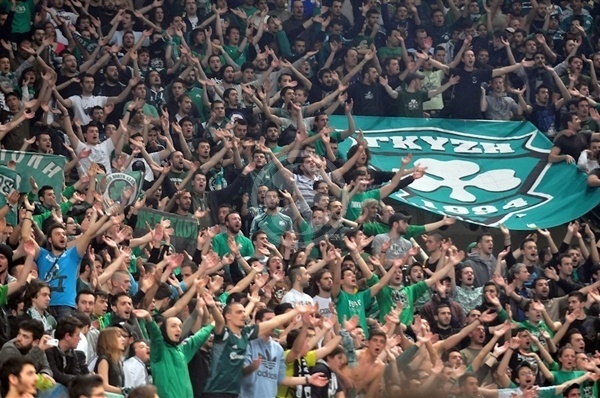 Panathinaikos is leading 1-0 and we are looking forward to playing the next game. We were shocked and this is big surprise, because in the last month we didn't play against a team of that level. We didn' t lose by 50 points, as has happened last season in the opening game between Olympiacos and Montepaschi Siena, but it could have happened. We played better in the second half, at least we had more passion and this is a positive point. In the first half we made mistakes, which are allowed only for children, and gave Panathinaikos the opportunity to hurt us. I can say that we played like a high school team. You know, basketball is a funny game. You see something and after 20 days you cannot see it anymore. Who was expecting Unics Kazan and Armani Milano to win here? Nobody, but they did it. 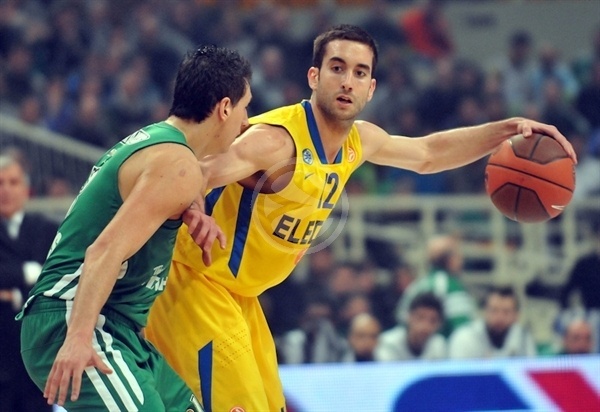 Panathinaikos has all my respect and I hope that they can't play better than they did tonight." "We played with a lot of energy, protected the ball and forced them into a lot of turnovers and we took advantage of them to score easy points. I am taking everything they give me, and since they let me score from three-point range, I did it. However there is a lot left in this series. Maccabi will be a different team on Thursday and we have to pay attention and avoid mistakes." "It was not an easy game; we made it easy the way we played. We played great at both ends, but I am sure that Game 2 will be much different. However we are focused on our target and we will try to take a 2-0 lead and go there with a clear advantage."